From the Manufacturers Label: Reduces Fine Lines and Wrinkles by 19% Thickens and Strengthens Hair Strengthens Nails Promotes Healthy Bones and Joints. The condition of your skin, hair, and nails depends on three proteins. Collagen plumps out the skin, removing wrinkles and preventing them from forming. In addition, collagen is essential for strong, health bones and joints. Keratin is the protein thats packed into your hair shaft. Keratin gives your hair thickness, body, strength, and elasticity. Plus, keratin gives your nails strength. Elastin gives your skin its ability to stretch and bounce back preventing fine lines and wrinkles. With age, collagen, keratin and elastin decline. 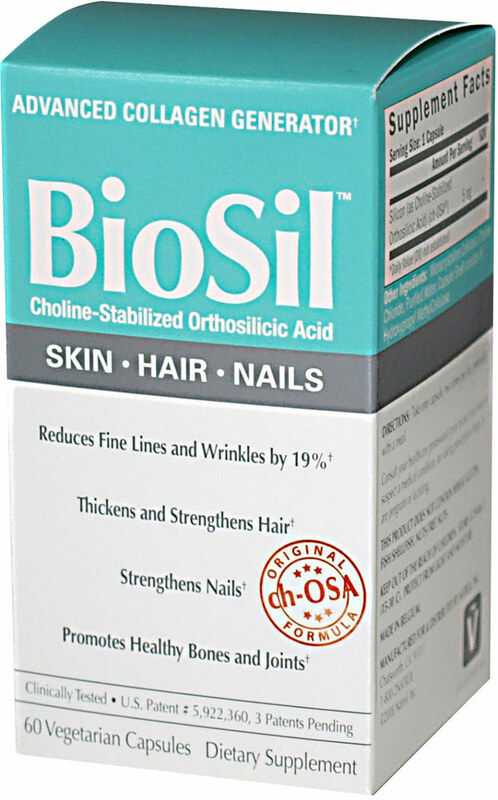 BioSil for Hair Skin Nails with clinically proven ch-OSA is specifically formulated to help nourish your bodys beauty proteins to restore them to more youthful levels.